When the Board of World Mission helps train mission teams, we remind members that when they come home, one of the first questions they are sure to face is “how was it?” This question can be overwhelming when it brings flooding back a host of memories, still fresh and unprocessed, of the ways that God is at work in the world, and the powerful ways in which you can experience community the world over through a shared connection of faith. The Moravian Church in Peru was founded in 2011 and established as a new Mission Area in the worldwide Moravian Unity. The Northern Province of the Moravian Church in North America accepted the responsibility to help guide the development of the Moravian Church in Peru, with much of the “leg work” being completed through the Board of World Mission. Since the beginning of this relationship, the four original congregations in Peru have continued to grow and have also taken up the call to mission outreach themselves. In the last year, these missionary efforts have resulted in at least four new groups learning about the Moravian Church and working towards eventually being established as Moravian congregations. The largest of these efforts is outreach to the Aguaruna people in the Amazon region of Peru. 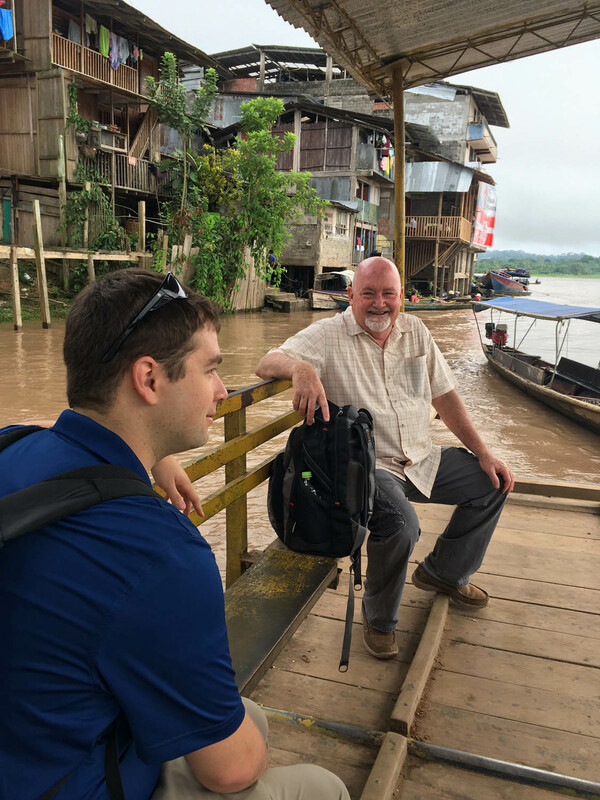 In April 2018, BWM Executive Director Justin Rabbach and Director of Mission Outreach Bishop Sam Gray joined leaders of the Peru Mission area in traveling to this area to host a church leadership workshop and explore the possibility of multiple congregations in this area joining as new district of the Moravian Church in Peru. In November, Justin, Sam and the Rev. Dr. Betsy Miller, president of the Provincial Elders Conference of the Northern Province, returned to learn more. It would be simple to describe all the ways in which the context of the new Moravian congregations in the Amazon region of Peru are different, but what is most powerful to me are the ways in which we are the same; the ways in which the Essentials of the Moravian Church are just as applicable on the other side of the equator as they are here, and not dependent on language, custom or culture. 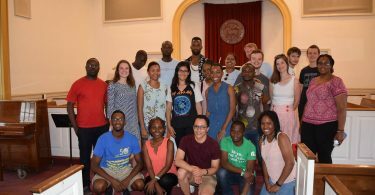 In the paragraphs that follow, Betsy and Sam share their reflections on a powerful trip to welcome folks who are the newest Moravians in the world… for now. This new development in Peru is one example of the powerful ways that God is working through the Moravian Church around the world, and the Board of World Mission feels lucky to represent the Moravian Church in North America as we help support and guide folks being led by the Spirit. It has been said that Moravians go where no one else would go to share the gospel of Jesus Christ. While that may be true, Moravians have never gone to a place where God was not already at work, preparing hearts, equipping the saints, and changing lives through our Lord’s amazing grace. In November, I was privileged to travel to one of those places – Bajo Canampa, in the Amazon region of Peru. It is not easy to get to this remote village – a 12-hour plane to Lima, another two-hour plane to Jaen, an overstuffed 90 minute taxi ride to Bagua Chica, a five hour minivan through incredibly winding, muddy roads to Santa Maria de Nieva, and a 45-minute ride up the Marañon River in an open, wooden boat. It was worth every minute to be greeted by children running down the river bank to meet our boat, swarming us with hugs as the adults offered embraces of welcome. While this was my second trip to the Moravian Church in Peru, this was my first trip to Bajo Canampa, which represented the fulfillment of a promise made by Brs. 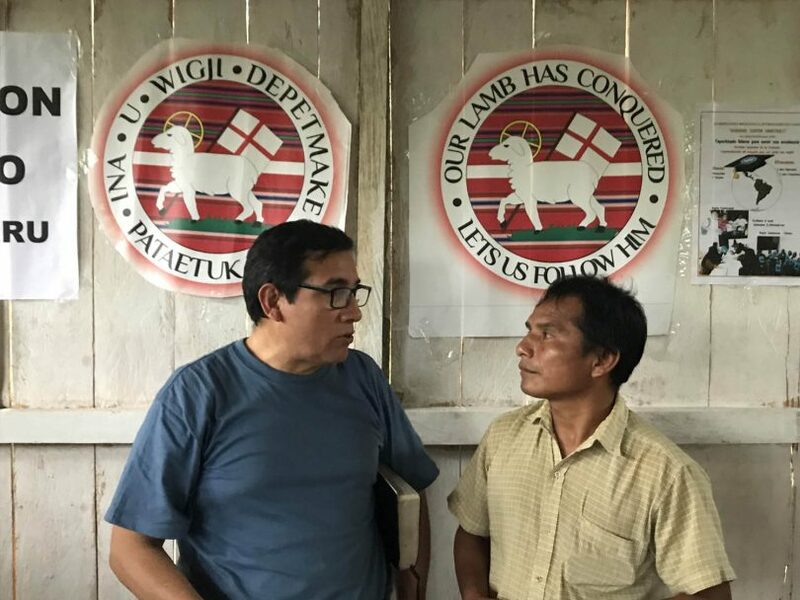 Rabbach and Gray who visited the village six months ago (the Northern Province has accepted the request of the Unity to act as supervising Province of the Mission Area of Peru). With four congregations formally received in 2015, leaders from these congregations have reached out to other villages, inviting them to join the Moravian Church. 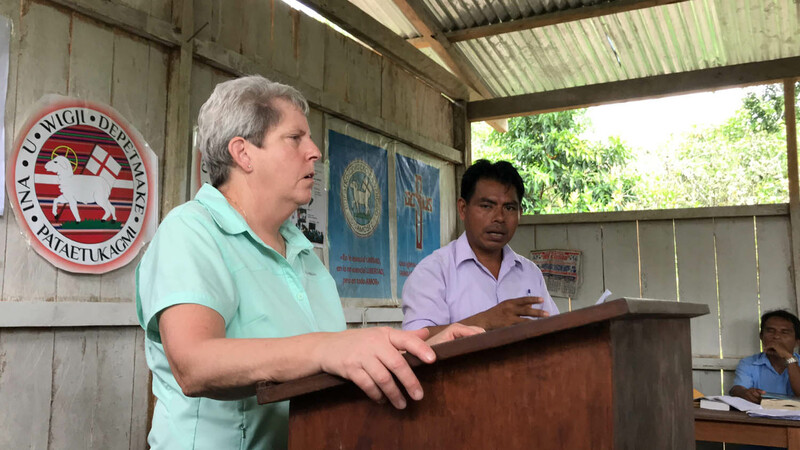 This visit was to determine if the Christians of Bajo Canampa and other Amazon villages wished to become the newest Moravians. Bajo Canampa sits on the edge of a river that is the only means of travel and trade. Huts made of bamboo poles, thatched roofs and dirt floors serve as homes, Sunday School rooms, kitchens, and dining rooms. We were served local food in abundance – fruits, plantains, eggs and rice, served on the ‘tablecloths’ of huge palm leaves. While eating our breakfast, we heard the squawks of chickens being butchered for our dinner that night. ‘Farm to table’ took on new meaning. Since Justin and Sam’s visit in April, the villagers had built a church – each adult was asked to bring lumber and, if possible, donate two roofing panels. What an act of faithful stewardship! Benches were built as needed to seat the growing congregation. We met in this new church that brought together pastors and leaders from congregations along the river. After two days of teaching about Moravian theology and ecclesiology in oppressive heat and humidity, and after asking if they had any questions about the Book of Order that governs the Moravian Church in Peru, Br. Christopher Valencia, President of the Moravian Church in Peru, welcomed 19 groups (from 17 villages) as Moravian congregations. We also witnessed six baptisms and eleven weddings. I preached in Spanish, with translation into Awahun, the local language. I watched as the very first Awahun language Seal of the Moravian Church was placed in the church. That was an incredibly humbling testimony to the power of God’s never-ending mission and our faithful response. The rest of our trip included meeting with another pastor who had prayed for three years to find a denomination so that he could be part of something bigger than his little band of six Christians, and be held accountable by a denomination. He told us that until he read the Ground of the Unity he thought no one else believed what he did. He felt at home with our theology and teaching. We also visited the ongoing work of the existing congregations in Chiclayo and Lima. They have all grown in numbers and faith since my visit three years ago. Thanks be to God! When I visit places very different from my own context, I discover God’s power and grace in new ways. I am reminded of the gift that God gave the Moravian Church to share with the world, and I am humbled to be part of this worldwide witness. Seeing that the congregations in Lima and Chiclayo had collected large amounts of food, clothing and Sunday School materials for the new Moravians in the Amazon region, and watching the distribution of these items (along with some t-shirts donated by the cast of “Irene” and pillowcase dresses from New Philadelphia Moravian in Winston-Salem). Discovering that the people in the village of Bajo Canampa (where our conference was held) had built a church building and a Sunday School shelter since we first visited in April. Witnessing the election and installation of the Provisional Board for the developing Amazon Region District of the Moravian Church in Peru, and the official reception (by President Christopher Valencia) of 21 Aguaruna pastors and leaders into the membership of the Moravian Church. Being present at the baptism of six new believers by the Rev. Christopher Valencia, in the muddy waters of the Marañon River. Worshiping, singing and dancing with children, young adults and older adults in Bajo Canampa, Zaña, Chiclayo and Lima. Praying for healing (from cancer) for our Lima taxi driver’s 5-year old son. Listening to the powerful testimony of three children at Somos Uno, two of whom are recipients of scholarships from the Unity Women’s Desk. One young boy came up with the idea of setting aside one of his toys each week until Christmas, when he will give those toys to others who have none. He challenged other children in the church to do the same. Sharing food and fellowship with Pastor Ana Maria and families gathered at Rey de Gloria Moravian church in Lima, and listening to children from her English Academy singing songs in several languages. Meeting with two pastors, one from Tacna and the other from Zaña, who have now been received into the fellowship and leadership of the Peru Moravian Church. Spending time in conversation and fellowship with Betsy Miller, Justin Rabbach, Manuel Verástegui (pastor from Lima who began the Amazon outreach efforts) and Christopher Valencia (President of the Peru Mission Area) and sharing in the excitement of what God continues to do among the people of Peru. Thanks to Justin Rabbach, executive director of the Board of World Mission, for coordinating this article and providing photos. For more information on the Moravian Church’s work in Peru, visit www.moravianmission.org. In photos above: Sam Gray and Justin travel upriver; Betsy Miller with children of Bajo Canampa; and a Moravian Seal translated into Awahun.